I’m not sure what it is about individual serving desserts, but they are certainly seem like more fun to eat. 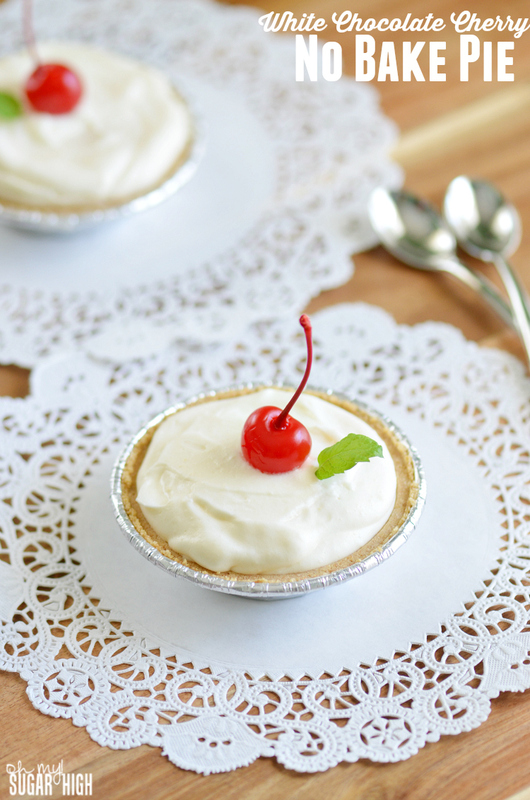 These easy White Chocolate Cherry No Bake Pies are a perfect example. Instead of using a single graham cracker pie crust, I thought it would be more enjoyable for my family to each receive their own mini pie. I was right! My kids thought it was so cool! It does take a bit more prep work to prepare the pies this way, but when it came time to serve it was much quicker and easier than slices of pie. This would make a perfect Valentine’s Day dessert but works well year round. Beat cream cheese and sugar until fully mixed. Whisk pudding and milk until well combined. Layer cream cheese, pie filling and pudding mixture in that order into pie crusts. Garnish with maraschino cherry and mint. Feel free to change up the pie filling with raspberry, blueberry or strawberry and top with fresh fruit instead of the maraschino cherry. It is very versatile! While the mint isn’t really necessary for flavor, it certainly makes the cherry stand out more and adds some nice color. I have a mint plant that I keep on my windowsill so I can easily grab some whenever I want. So much cheaper than buying mint from the store! 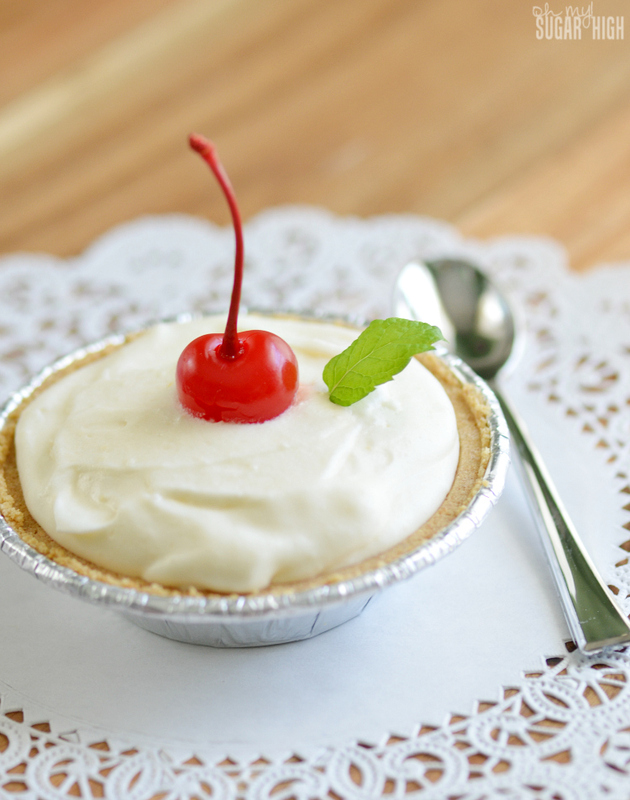 Do you have a favorite mini pie dessert? 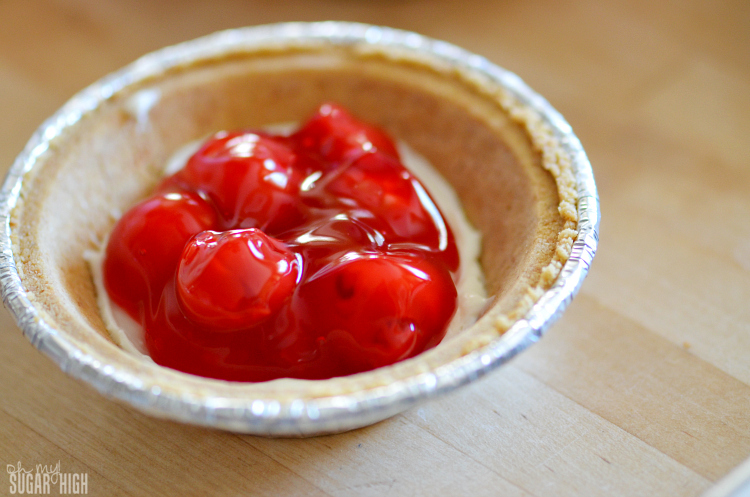 If you give these White Chocolate Cherry No Bake Pies a try, let me know what you think! These look so delicious and the whole no-bake aspect makes them even more awesome! Pinning!